Tychem BR chemical resistant coveralls protect against more than 200 chemicals, including the ones most involved in industrial or HazMat incidents. The attached overboots and elastic wrists will keep your clothes and skin clean. Tychem BR coveralls are soft, lightweight and puncture/abrasion resistant. 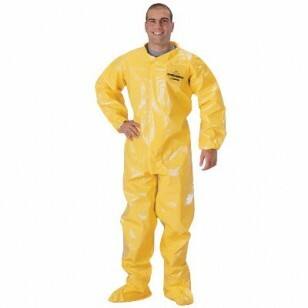 Yellow color provides high visibility making these chemical suits excellent for HazMat teams. Coverall with collar, elastic wrists and overboots. Available in small-5x.